During the last week or so, I have seen a number of men with theodolites taking measurements on Dingwall Road and outside East Croydon Station. I see that one of the derelict areas, highlighted by this site, has had a planning application lodged for its demolition and reconstruction. 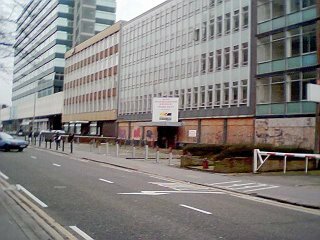 Trafalgar House, on Bedford Park Croydon, will be demolished and a new office building put in its place. That is good news, if it goes ahead. However, the wasteland next door (a real canker on Croydon's backside) is not part of the plan. I suspect that any company, wishing to use the new office building. may have some concerns about that.